I arrived one morning at the Van der Weyden to find someone had taken my place. He was standing exactly where I normally stood and for a moment I was startled, as if beholding myself beholding the painting, although he was thinner and darker than I. I waited for him to move on, but he didn’t. I wondered if he had observed me in front of the Descent and if he was now standing before it in the hope of seeing whatever it was I must have seen. I was irritated and tried to find another canvas for my morning ritual, but was too accustomed to the painting’s dimensions and blues to accept a substitute. I was about to abandon room 58 when the man broke suddenly into tears, convulsively catching his breath. Was he, I wondered, just facing the wall to hide his face as he dealt with whatever grief he’d brought into the museum? Or was he having a profound experience of art? A profound experience of art? I had long worried that I was incapable of having a profound experience of art and I had trouble believing that anyone had, at least anyone I knew. I was intensely suspicious of people who claimed a poem or painting or piece of music “changed their life,” especially since I had often known these people before and after their experience and could register no change. 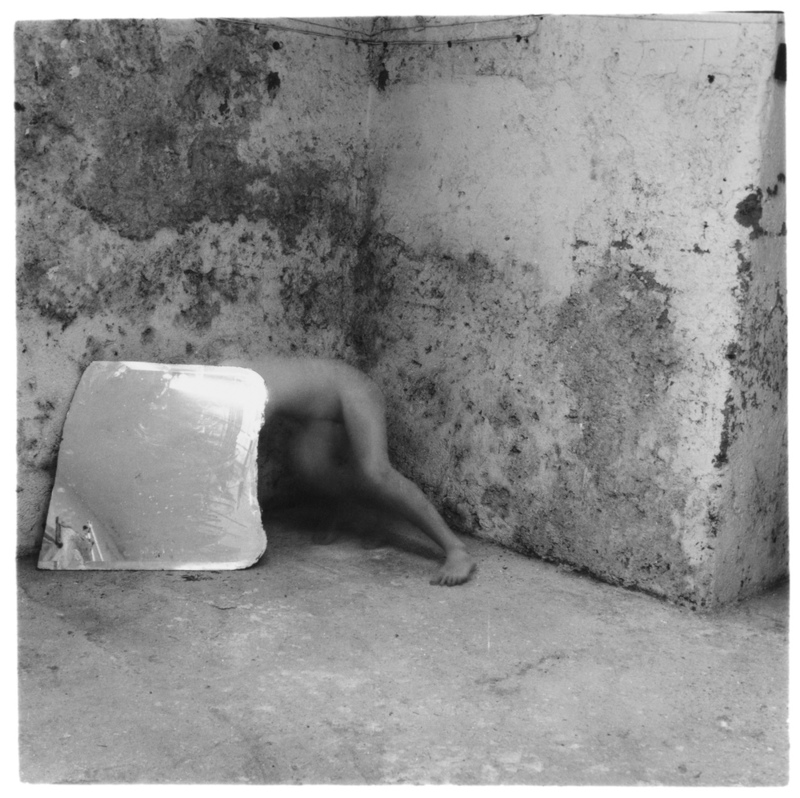 Francesca Woodman, “Self-portrait Talking To Vince,” gelatin silver print, c.1980. SCAD Permanent Collection. I have been reading the opening of Leaving the Atocha Station several times this summer. I read it because I really like it, I like the language, the tone, Adam Gordon’s (the narrator) (or is it Ben Lerner’s) insane humor (Adam is convinced that Ortega y Gasset is two people, like Deleuze and Guattari). And I read it because it’s postulation worries me. I’m tempted to say that I basically share the conviction of Adam, I share his doubt regarding the possibility of a profound experience of art, I doubt art’s possibility to change the world, and I definitively doubt my own ability to write in a way that adds anything positive to the situation. I also share Adam’s distrust in people who claim that art has changed their life. The closest I’d come to having a profound experience of art was probably the experience of this distance, a profound experience of the absence of profundity. So obviously I, just as Adam, am up against a contradiction in terms. On the one hand we dismiss the value and importance of art – on the other we spend all our waking hours visiting exhibitions, studying art/literature and writing about it, wrapped up in art, giving it a tremendous place in our own, personal lives. The best Ashbery poems, I thought, although not in these words, describe what it’s like to read an Ashbery poem; his poems refer to how their reference evanesces. And when you read about your reading in the time of your reading, mediacy is experienced immediately. It is as though the actual Ashbery poem were concealed from you, written on the other side of the mirrored surface. And you saw only the reflection of your reading. But by reflecting your reading, Ashbery’s poems allow you to attend to your attention, to experience your experience, thereby enabling a strange kind of presence. But it is a presence that keeps the virtual possibilities of poetry intact because the true poem remains beyond you, inscribed on the far side of the mirror: ‘You have it but you don’t have it/You miss it, it misses you/You miss each other. Adam Gordon is a remarkable outsider, he might seem isolated, solipsistic even, but the fact is that reading his tale is a bit like watching oneself in (to use Adam’s own metaphor) a distorted mirror – oh yes; I recognize this guy, this world … still it remains beyond me. – what about the illustration for this post, why is the American artist Francesca Woodman suddenly showing up in this post on the (in)possibility of profundity? To be honest – I’m not quite sure. I suspect it might have to do with intensity, with her showing us that art is to live and die for. She (and then not only her work) might actually function as a true image of A profound art experience? At the age of thirteen Francesca Woodman took her first self-portrait. From then, up until her untimely death in 1981, she produced an extraordinary body of work (some 800 photographs) acclaimed for its singularity of style and range of innovative techniques. Woodman studied at Rhode Island School of Design. Francesca Woodman committed suicide at the age of 22. “Francesca Woodman committed suicide at the age of 22.” This terrifies me and leaves me profoundly sad. I teach undergraduates, everyone I teach is between the ages of 17 and 22. And I know how some of them suffer deeply, and I cannot reach them (and in some ways that is not my job; and in some ways it is my only job). Woodman was obviously so talented. It is interesting that you chose her work with this post that dovetails with Ashbery’s poems. I find his work can be difficult in that he often sets up a kind of distance between himself and the reader; and on second or third readings, there is often–at least in his best work–a sudden “way in” to the words, an opening that may not be Ashbery’s but that IS the readers. Wow, I’m finding it very difficult to put into words what I mean. Maybe I am suffering from a profound experience of art? I just listen to this interview with an essayist who said that he suddenly had grasped a poem by Goethe, a poem he had known for forty years. It wasn’t exactly that he hadn’t understood it before, more like he suddenly felt it – the poem – with his whole body. Maybe he was talking about a profound experience??? Thank you for your wonderful, wonderful blog. Thank you so very much for kind words and for your recommendation, Bad New Days: Art, Criticism, Emergency by Hal Foster is now officially on top of my reading list!